Those who know me know that I am a bit obsessed with Kickstarter projects of late. It all started with Shovel Knight, and I’ve been dutifully backing cool-looking projects ever since. While all the games I backed are near and dear to my heart, the ones who made a comeback after not initially reaching funding are especially important to me. I’m a sucker for the underdogs of the world, and such is my good friend Pip! 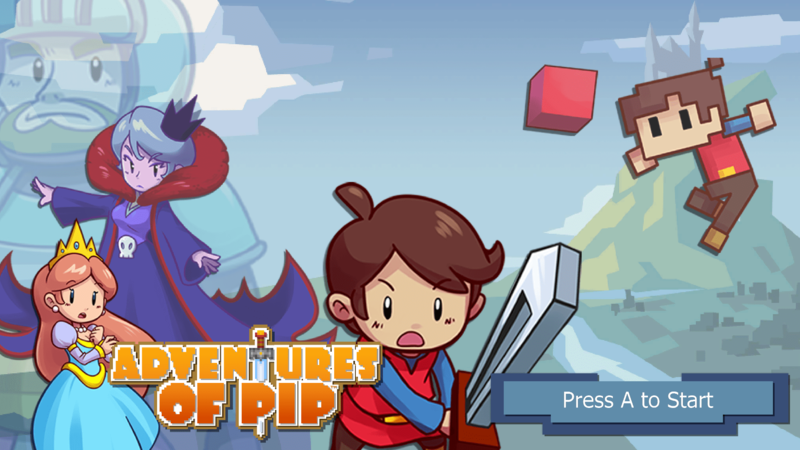 Adventures of Pip didn’t get funded the first time, asking for a reasonable goal of $90,000 that was not met. Luckily for us, the team at TicToc Games didn’t give up, and managed to lower the goal and get funded the second time around at approximately $65,000. Though this meant the game wouldn’t be quite as epic in scope as initially planned, I knew Pip would be worth the wait. Given that many of the talented staff at TicToc are also originally from WayForward, much like those at Yacht Club Games, I couldn’t help but view Pip as the little cousin of that cerulean crusader, Shovel Knight! 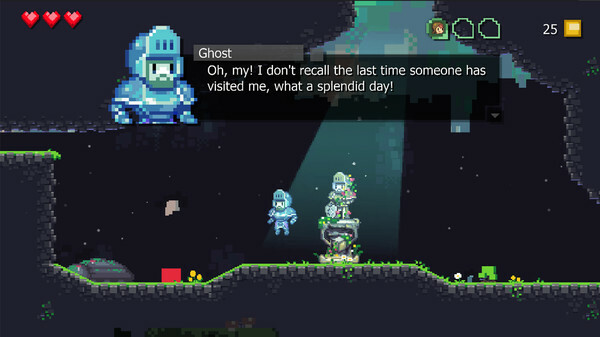 Thus the question comes to mind – Did Adventures of Pip succeed in being its own fantastic game, or was this pixelated protagonist lacking resolution? 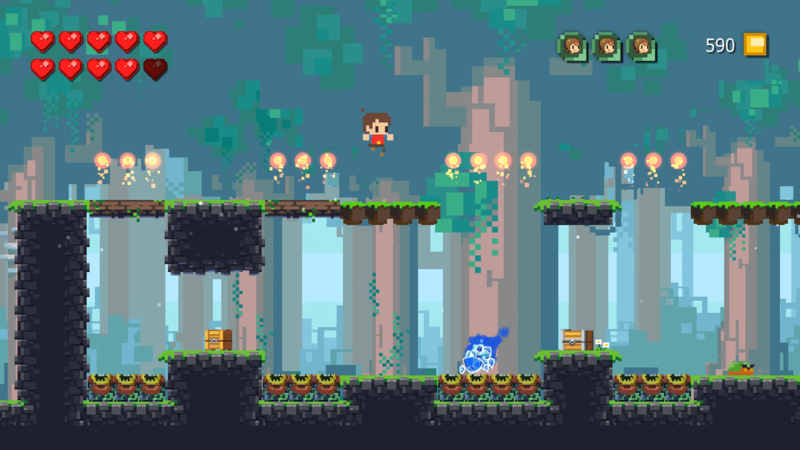 The first thing you need to know about Adventures of Pip is that it is a game all about the evolution of video game graphics. 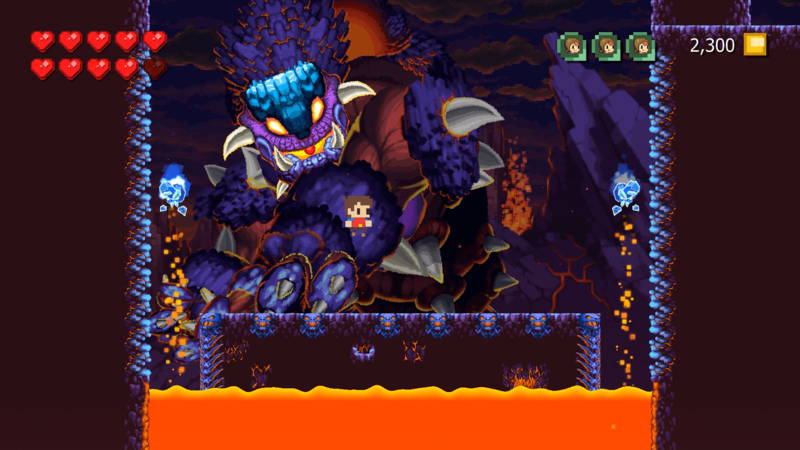 This theme is echoed in the gameplay, as Pip can evolve from a humble 8-bit cube to a nimble 16-bit boy to a lumbering, sword-wielding 32-bit warrior. Not only does this make gameplay compelling, as you need to transform on the fly between all three forms, but it also ties into the plot. In a very self-aware fashion, the story contends with graphics snobs, called Rezists, and is most apparent when you see that the ruling class is 32-bit, the middle class is 16 and the commoners are 8-bit. Cue evil villain, Queen DeRezzia. Her goal is to utilize the limitless powers of the Bitstream, of which the captured Princess Adeline is a conduit, to make everyone the same resolution, except herself (a girl has to look her best, after all!) The game begins with DeRezzia’s assault on the Royal Castle, as she absconds with the Princess and transforms anybody who would mount a rescue into lowly 8-bit cubes. Not dissuaded by such a development, since Pip was born 8-bit, he sets out to save the princess! After leaving the Town adjacent to the Castle, which serves as the hub where you can buy upgrades and items, Pip heads to the Forest and comes across a Ghost who bestows upon him the power to tap into the Bitstream, thus allowing Pip to evolve to his 16-bit form. Later on, you find another spectral ally who provides a sword which allows Pip to make his final evolution into 32-bit. Transforming into different forms is a piece of cake, with one proviso. In order to do so, Pip must squash a blue-hued enemy that is charged with the Bitstream. These are found all over each level, and a simple bop on the head will transfer power into Pip, instantaneously transforming him. It’s even easier to transform into his simpler forms, just requiring holding the A button until Pip changes with a burst of energy. This is also the only way to break the game’s otherwise unbreakable purple blocks. Each form has its strengths and weakness. Though the 8-bit cube can only hop about, it is also able to float by holding the jump button, and can bounce the highest. Meanwhile, 16-bit Pip is fast, able to bash foes with his fists and can wall jump. Finally, 32 bit Pip swings a mighty sword capable of breaking blocks and is the heaviest of the three forms. What’s great about this system is how you need to master it early on and become adept at transforming at a moment’s notice, many times mid jump or hovering over a bottomless pit. 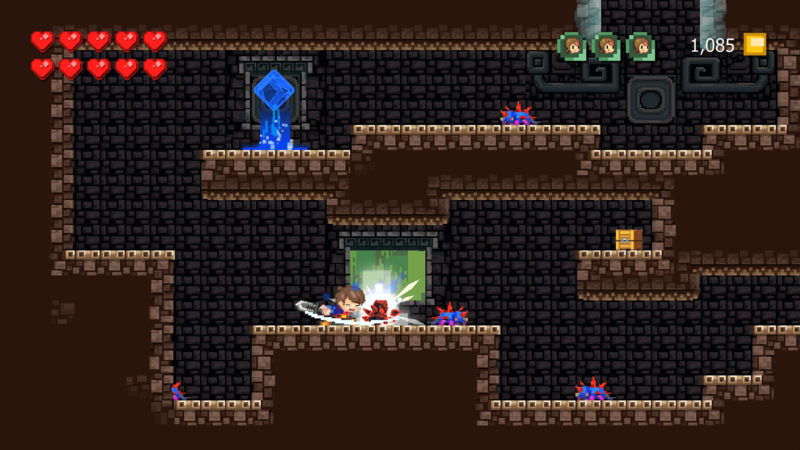 Which brings me to my highest compliment I can give Adventures of Pip — it features pixel-perfect platforming. The controls are very responsive and smooth, and I had no issue jumping or bashing foes (when I had limbs, that is.) I suppose the downside is that inexperienced hands at platformers may have a rough time with this system, but, luckily, you have no life counter to worry about, so you can constantly restart over from your last checkpoint. It’s very satisfying to figure out how to proceed by skillful use of your abilities. See that blue guy down there? Bash him to get some Bitstream power! 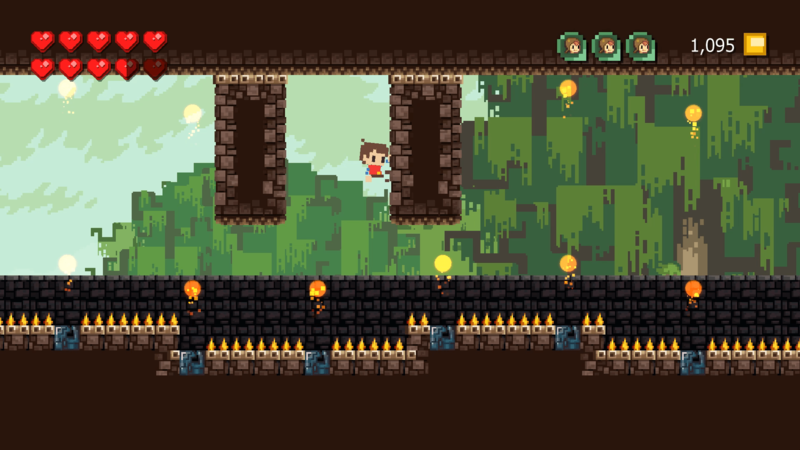 You’ll traverse five distinct lands in your quest to save the princess, ranging from a peaceful Forest to a murky Swamp to damp Cave to burning Lava fields to Queen DeRezzia’s dark castle. It might sound like a short trip, but each world is composed of eight different sections, with the exception of DeRezzia’s Castle. Each world is headlined by a boss fight at the very end, about which I have some mixed feelings. While you could just rush through each area, it’s much more satisfying to get a perfect score by rescuing the three hidden villagers found in every level. These are pretty easy to nab to start, but, the farther you get get in the game, the more frustratingly well hidden they get. The game makes some definite nods to Metroid, most especially in hidden walls and the sound effect you hear when you’re low on Hearts. Each level can be downright labyrinthine to find all the secrets, which, thankfully, adds replay value to the experience. I managed to beat the game in about five hours, missing only 15 out of the total 108 lost villagers. I can’t help but wonder what I might unlock by finding them, but I’ll have to discover that later. This lovely fellow was an utter pain to defeat. Speaking of bosses, I should probably clarify what I said earlier. While it’s true that each boss in the game is very distinct visually, ranging from an overgrown caterpillar to a Mayan death machine and more, the fights themselves ranged from predictable to overwhelming. This is due to the fact that almost every boss can be defeated with three solid hits, making each fight a simple matter of avoiding them until they stop moving, then transforming and bashing them. While not every boss was disappointing, and I truly loved the Swamp, Lava and final bosses, overall, they were underwhelming. Which is unfortunate, since they all looked so cool. Perhaps I’m being overly hard on them, as I no doubt expected something more challenging after the incredible bosses in Shovel Knight. After all, Pip is his own hero, and there is no reason this game should play the same as any other. I just went into it expecting a bit more flourish to these encounters. Visually speaking, Adventures of Pip is a masterpiece. It manages to pay homage to each graphical style present in the game without making any of them feel underutilized. For example, the Forest areas seem to incorporate 8-bit pixels to make very vibrant, yet retro-looking trees, whereas the Ruins found in the Swamp area are decidedly more 16-bit, and the Lava and Cave sections look 32-bit. It’s hard to explain entirely, but, once you’ve played the game, I’m confident you’ll see what I mean. Suffice to say, the game is infused with retro charm, and Pip and his foes look outstanding and diverse no matter what the resolution. As for the audio side of things, TicToc scored again, offering a robust and emotional soundtrack. Each area has a totally different feel, and the boss fights themselves are well suited to the frantic tunes therein. Jake “Virt” Kaufman, as always, has once more outdone himself here, and the sound effects in this game only add to the overall experience. My only complaint is that there is no voice acting in the game, as many of the characters are bursting with personality, with the exception of Pip himself. Much like Link, he is a stoic and silent hero. From a technical standpoint, Pip delivers, with one minor nag. While the game looks great when played on the TV or on the Wii U GamePad itself, I did encounter one recurring issue. Namely, there were several times where the gameplay would freeze momentarily in the midst of the action. Though this was hardly game breaking, and never lasted more than a very brief moment, it made me a little stressed out when working my way through a particularly challenging section. Now it’s more than possible this was due to me playing the game most of the time on my GamePad, though I’ve never encountered this issue with other games. More than anything it was surprising, since 98% of the time the game runs silky smooth. Must not fall… Must not fall! In the end result, I was very pleased with Adventures of Pip. It wasn’t a perfect experience, mostly due to the boss fights and recurring glitch, but it was a hell of a lot of fun. The puzzle platforming was a delight, and the hidden villagers add much-appreciated replay value to the relatively short experience. The art and music come together to make a very vibrant and enjoyable experience, and one that shouldn’t be missed for fans of Wii U at a mere $14.99. Whether you get this on Wii U or Steam, Pip is a hero for all resolutions!